Individuals who volunteer with the Council will be issued with a Volunteer Information Pack. This pack provides them with the necessary information before carrying out any work, such as lone working procedure and risk assessments. Want to get involved with the works of the Coast and Countryside Section? The work of volunteers makes a big difference in achieving the goal of conserving our wonderful environment. Volunteers play a vital role in a number of areas of work – from helping to manage our marine wildlife to improving rights of way. had enough of overgrown stretches on footpaths? fed up of gates not opening, and over grown styles? do you have interest in the countryside, walking, riding or cycling? do you have a favourite path you tend to use regularly? If so the adopt a path scheme may be of interest to you! 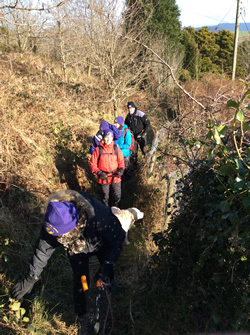 Ceredigion Council’s Coast and Countryside department manage over 2500 km of public footpaths within the county. The path network include public footpaths, bridleways and restricted byways. The path networks go through several different land areas, such as the highlands of Tregaron and Cwm Rheidol to some of the agricultural fields of lowland southern Ceredigion. Some footpaths also run parallel to the River Teifi and its diverse native woodlands. There is an option for everyone, whatever interests you! Walking is one of the simplest forms of exercise and getting active. By cycling, walking, riding and maintaining the footpath network, you could easily achieve your 150 minute of recommended weekly physical activity. This has numerous benefits for personal health. By getting involved you could also be helping your local community. walking footpaths or bridleways regularly to help record any access issues such as broken gates, stiles, obstructions etc. The scheme is open to everyone over 18. If under 18, you can still take part with a parent or guardian or supervising adult. Taking part is very easy. You can either contact Jill Lowry, the Community Access Officer, directly on 01545 574140 or via email - Jill.Lowry@ceredigion.gov.uk or you can fill in one of our attached forms, and let us know which parish you live in. The rights of way department will be in touch after that. Ceredigions Rights of Way Rangers rely heavily on their teams of volunteers to carry out much of the work keeping our public rights of way open. Depending on the weather and the type of work which needs doing, there is a team out working most weeks. If you would like to get involved, then please contact the Ranger for the area you are interested in.